A handful of cargo cars have derailed and tipped their grany load this morning closing Dock Street. BNSF crews were on the scene as of my bike ride in around 8am this morning and the heavy equipment is ready to hoist the cars from their side. Not sure how long a clean up like this takes but I imagine it'll be open sometime today but expect future delays as the fence and tracks along there are repaired. It doesn't appear that anyone was hurt in the accident. The 15th Street overpass is your only out coming from the Museum of Glass area but, if you're coming from Schuster, don't even bother and instead just take 705 or Pacific Ave.
by morgan on 6/15/2009 @ 9:16am Wow! Good thing it was only grain. Imagine if they were carrying corn syrup... or some toxic chemical. Scary! by Mofo from the Hood on 6/15/2009 @ 9:19am That grain will be gone by tomorrow morning...wharf rats. by L.S.Erhardt on 6/15/2009 @ 12:28pm Good thing it wasn't LPG. Everything within a 500m radius would have to be evacuated... including a good portion of downtown. by boearc on 6/15/2009 @ 1:31pm Hey - did you get this accident confirmed or did you just assume that it happened because you saw it and photographed it? Need to verify with proper sources before posting as your photos could be misleading of the actual situation (maybe the railroad is trying some sort of new drying system for the grain - if it is grain...). by KevinFreitas on 6/15/2009 @ 2:33pm @boearc: I snapped the pics myself as I rode my bike through there this morning. One of the guys on the scene filled me in and said it was a derail. Not trying to besmirch the good BNSF name, to be sure, but I don't really care how it happened (new grain storage method or otherwise). Train cars were tipped, road was closed. That's what I could manage between my ride in and starting my day job so that's what I reported. Given more time I may have called Tacoma Rail, BNSF, WSDOT, etc. Always open to everyone contributing though so anyone can feel free to provide any updates, links, or other relevant info anytime in the comments. by boearc on 6/15/2009 @ 3:06pm Kevin - I was attempting a joke at the expense of the main stream media - next time I'll add a little :-) - as you guys on bikes seem to be more aware of the world around us than an editor sitting in a formerly smoke filled room checking sources. by KevinFreitas on 6/15/2009 @ 3:20pm @boearc: Haha, yeah, a little smiley goes a long way I suppose. Figure I'd get on my soapbox nonetheless. It's always great to see folks practicing observational, hyper local reporting via sites like FeedTacoma, Twitter, and such. Keep it coming! Only in Tacoma I suppose. But the details will probably flesh out there. Unless our resident railfan chimes in. There some good BNSF acronyms that were invented out of the BN & SF merger. Most are even clean. by morgan on 6/15/2009 @ 10:06pm Did the rails in Tacoma shift over the weekend or something?! 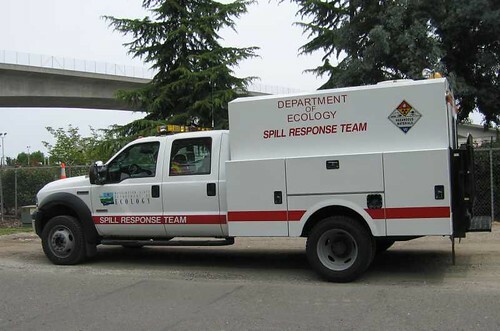 I just heard on TV that a couple trains collided two hours ago near Puyallup Ave.
by ixia on 6/16/2009 @ 10:48am It looks like there were two separate train accidents yesterday down on the waterfront!? Thanks to Kevin we have pics of the first one at the above location at around 8am. The second one was about 7:45 p.m. (according to multiple sites) when it collided with another train that was switching cars in the switching yard near the Tacoma Dome. 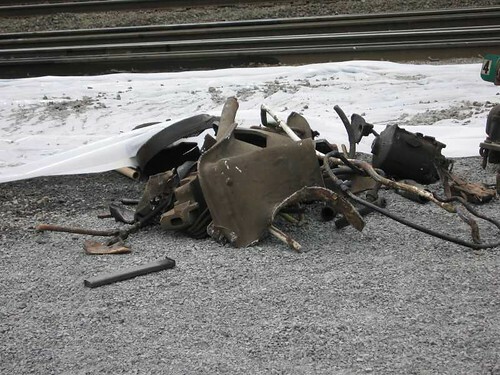 There the locomotive derailed, the engineer was injured and it spilled about 1,500 gallons of fuel. And the Tribune had nothing on either in the paper this morning... only the second accident made their website. Wierd. by morgan on 6/16/2009 @ 11:30am Isn't that strange? The first accident was not mentioned on the evening news either when they reported the collision. I'm glad the 1,500 gallons of fuel wasn't spilled on Dock Street! 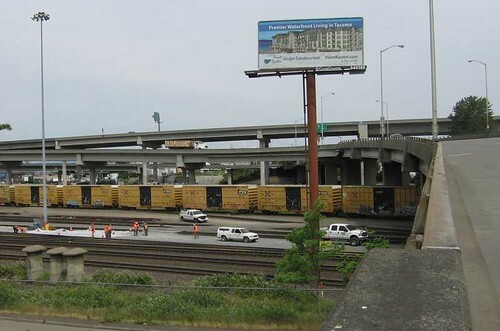 I see issues in the future of having a major freight train center (BNSF) adjacent to the Thea Foss and its condos. I wish the Port would take up the issue of routing the trains across the mountains so we can get them off our waterfront. Just imagine Old Town to Point Ruston being freed of the constraints of train tracks! We could even run a trolley from Thea to Ruston rails with the trains gone! by KevinFreitas on 6/16/2009 @ 9:40pm All looks mostly well this morning when I passed by. No more toppled cars but there was visible damage on them. A section of track was removed and the roadside fence rolled up to be deployed to avert our attention from the tracks again. by morgan on 6/17/2009 @ 9:23am dezznuts69: because the route is shorter through the existing tracks through the mountains than it is to go south and then over like they currently do. The hold up has been that shipping companies do not want to upgrade the tunnel through the pass to accommodate the double stacked trains they switch to years ago. The tunnel under Pt. Defiance used to be double tracked until they converted to one single track down the middle exactly because of the new method of stacking containers. It would cost only 5 cents per container to make the Cascade tunnel usable. But the shipping companies - and thus the Port of Tacoma - think that's too much. Why our elected officials don't put more pressure on the Port to do better is beyond me. Don't even get me going on the Murray Morgan bridge. by ixora on 6/17/2009 @ 12:33pm So I went down to the location of the second accident yesterday on my bicycle and took some pics and asked some questions. 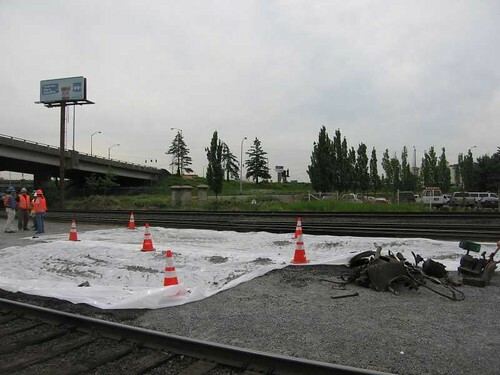 gallon diesel spill under/around the plastic covering. This shot is from the Portland Ave. overpass. by Nick K. on 6/18/2009 @ 3:55am Morgan: I can tell you rerouting trains from the waterfront is of absolutely no concern to BNSF, Union Pacific, or the State of Washington when it comes to increasing capacity over the passes. Now when you say 'make the Cascade tunnel usable' I'm not exactly sure what you mean. Currently there are three east/west routes through the Cascades; Stevens Pass, Stampede Pass and the Columbia Gorge. There used to be four but Snoqualmie is now a bike trail. Stevens Pass, and the "Cascade Tunnel," is where BNSF currently routes almost all of its east/west container traffic from/to Seattle/Tacoma and Chicago. It's been at, or nearly at, capacity for at least two decades and no major upgrades to the line, short of RE-elecrification, could significantly ease congestion. The issue that has been up in the air for decades (and three incarnations of railroad ownership) is whether to the tunnel under Stampede Pass should be lowered to accommodate container traffic. 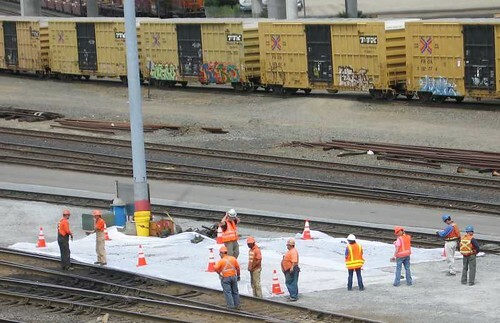 BNSF has shown no real desire to undertake the operation since reopening the line in 1996 and currently seems content to use Stampede as a relief valve for empty (and occasionally loaded) grain trains, such as the one that spilled onto Dock street on Monday. Best bet is BNSF will continue to sit on the issue until capacity constraints deem it absolutely necessary, or the competition mounts a successful campaign for usage rights (more on the competition in a second). Either way, most BNSF merchandise traffic, grain, and coal loads will likely continue to route its way south/north through Tacoma and east/west through the water level Gorge route. In reality, any traffic routed over Stampede Pass versus the Gorge is about the same distance, considering that they both go to the the same place; Pasco. Pasco is also where BNSF's major classification yard is located. Now if any tunnel upgrades were to route any traffic from the Tacoma waterfront it would be concerning the Union Pacific via Stampede Pass. U.P. has accessed Seattle/Tacoma via "trackage rights" from Portland since the turn of the 20th century. Their only east/west connection is through the Columbia Gorge, again via Portland. U.P. has been itching for a direct route to Seattle/Tacoma for a while and BNSF is not willing to just give up that monopoly for nothing. Some grand bargain would have to be reached in order for this to happen. It's a logical inevitability that could happen either tomorrow or 30 years from now. It's a long debated, sometimes irrational, issue that really has little to do with either the State of Washington or the Ports of TacomaSeattle. It comes down to the politics of railroading; plain and simple. Here are a few pretty long and rather passionate threads concerning this very topic that you might find interesting. "Yakima Industrial lead getting a HUGE face-lift!!!" "Washington State and UP will upgrade Stampede Pass"